Richard Paul Astley (born February 6, 1966) is an English dance-pop singer, songwriter and musician. He was born in Newton-le-Willows, St Helens, Lancashire, England. Astley currently resides in Richmond, Surrey with his Danish girlfriend, Lene Bausager, and their daughter, Emilie. In 1985, Astley was playing the club circuit as a singer with a soul band named FBI, when he was seen by the record producer Pete Waterman and persuaded to come to London to work at the PWL recording studio. In 1985, Astley was playing the club circuit as a singer with a soul band named FBI, when he was seen by the record producer Pete Waterman and persuaded to come to London to work at the PWL recording studio. Under the tutelage of production trio Stock Aitken Waterman, Astley was taught about the recording process and groomed for his future career, supposedly starting off as the recording studio 'tea boy'. During much of his career prior to the proliferation of music videos, many listeners assumed he was black. In one instance, the comedic entertainer, Sinbad, discussed him with a talk-show host, expressing his surprise that Astley was not "one of the brothers." Even after his visual appearance, it was still popular belief that he was miming for a black American singer. His brother Mark Astley helped to refute this assertion. His first single was the little-known "When You Gonna" credited to Rick & Lisa, but his first solo outing was "Never Gonna Give You Up," released in 1987. It became an immediate success, spending five weeks at the top of the British charts and becoming the year's highest-selling single. It was the first of no fewer than 13 (world-wide) Top 30 hit singles for him. The album Whenever You Need Somebody also reached Number One in the UK, and the hit singles continued, including the title track and a cover of Nat King Cole's "When I Fall In Love." 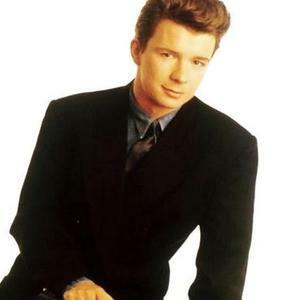 On 12 March 1988, "Never Gonna Give You Up" had also topped the U.S. singles chart and was followed by a second U.S. #1 on 18 June with his second U.S. single release "Together Forever." By the end of the decade, Astley had parted company with Stock Aitken Waterman. He achieved one more major success with the 1991 ballad "Cry For Help," which reached the Top 10 in both the UK and the U.S. It featured a gospel choir arranged by Andra? Crouch, who'd also been involved with Madonna's 1989 hit "Like A Prayer." His next album Body & Soul was released in 1993. The album did not chart in the U.K. and managed to make The Billboard 200 peaking at a lowly #182. The two singles, The Ones You Love and Hopelessly performed very well on the adult contemporary chart, peaking at #19 and #4 respectively. Hopelessly also crossed over and peaked at #31 on the Top 40 Mainstream chart. For much of the 1990s and early 2000s, Astley remained largely out of the spotlight. In 1991 the RIAA certified that two million copies of Whenever You Need Somebody had been sold. Total world sales of Astley's records (inclusive of singles, albums and compilation inclusions) have reached 40 million. Almost 10 years after "Body & Soul", Rick finally returned to the music world and released "Keep It Turned On" in 2002. The album featured the single "Sleeping", which became a minor club hit, thanks to a set of remixes from U.S. house producer Todd Terry. In 2005 Astley released the album Portrait in which he covered many classic soul standards such as "Vincent", "Nature Boy" and "Close To You". In early 2006, Astley withdrew unexpectedly at the eleventh hour from appearing on the BBC TV celebrity/pro duets show Just the Two of Us after committing to the series. This led to criticism from those in the entertainment industry and media. His place was filled by opera singer Russell Watson, who eventually won the competition. The BBC failed to explain that Astley's withdrawal was due to his partner Lene Bausager being nominated for the 2006 Academy Award for Best Live Action Short Film for her produced/directed film "Cashback". Astley would have missed a crucial part of the show by attending the awards ceremony and so withdrew before the show started its run. Based on various music charts in the UK, U.S. and Canada, Astley has charted a grand total of 14 (different) hit singles and 6 (different) hit albums as of March 2006. During the later part of 2006 and the beginning of 2007, the song "Never Gonna Give You Up" became part of an internet meme similar to the "Duckrolling" of the 4chan game forums. A link would be submitted to the forum, in the first instances to a supposed trailer of a new game, and would redirect the user to the video. This process fondly became known as a "Rickroll", and the usage of which has developed exponentially since. As a result of the increased publicity Rick Astley's former record company (RCA) released a greatest hits album.